Q. 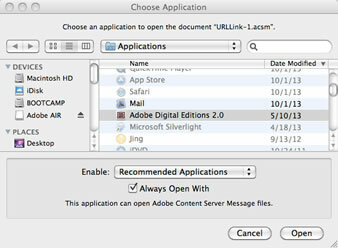 How do I set Adobe Digital Editions to open ACSM files automatically using a Mac? Hold down the Control key, and click on the .acsm file. This opens a small menu, choose “Always Open with..” and set to Adobe Digital Editions. A new window opens. Select Adobe Digital Editions from the list and check the “Always Open with...” box. Adobe Digital Edition simply does not work on a Mac. The Apple store reviews confirm this. When I tried to read the ebook online, that function didn't work. When I tried to return the eBook, that didn't work. It told me to return the eBook from my digital reader, which I do not have. I could use literally nothing from the Enki service. by Jim on Feb 09, 2015. According to the iTunes store, Adobe Digital Editions is the one eBook reader for all your Adobe DRM protected books across your iPad, Mac or PC. Use it to read EPUB and PDF books, both online and offline. Borrow ebooks from many public libraries for use with ADE. https://itunes.apple.com/us/app/adobe-digital-editions/id952977781?mt=8. Please contact enki support if you need assistance with returning an enki eBook. by Susan on Feb 10, 2015.